I often felt dislocated when I lived in LA after college. I had grown up there and my family is there, but I felt that I was lacking a community. I had left Berkeley after just having started to meet people who were interested in writing poetry. My efforts to revive some semblance of the poetry community often resulted in less-than-satisfactory results. In a similar manner, when I decided to start writing Vinicultured, I found that the LA wine blog community was fragmented. This is not to say that it doesn’t exist: it probably does. However, finding and relating to other writers/wine aficionados was a difficult proposition for a young fledgling wine blogger. It was only when I got to DC that I started to find some semblance of a wine community. Some of my law school friends and I started the DC Wine Appreciation Society, which was basically an excuse for us to get together and drink good wine to the point of excess. I made contacts at local wine stores (like Patrick Deaner at the now-defunct Wine Specialist, Jeremy Silva at Potenza, and Phil Bernstein over at the excellent MacArthur Beverages). Working at Ansonia Wines was and continues to be an excellent and insightful experience. And starting the DC Wine Buyers Collective was a great way for me to start to get a feel for what members of the 25-35-year-old demographic wanted to drink. With my decision to stay in DC after graduating from law school, I have had more incentive to get out there and network. Fortunately, many networking opportunities have come up, especially this past week. I was invited to a comparative tasting of Schramsberg Vineyards‘s excellent sparkling wines, which I attended yesterday afternoon, and will be first volunteering at and then covering the DC Wine Riot tomorrow and Saturday. 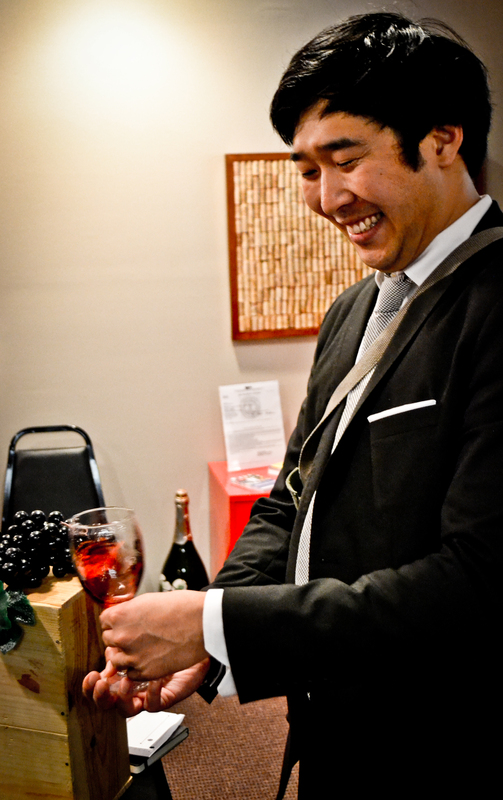 I was also invited to DC Wine Week‘s “Washington Wine Academy Tasting Class” (a.k.a. 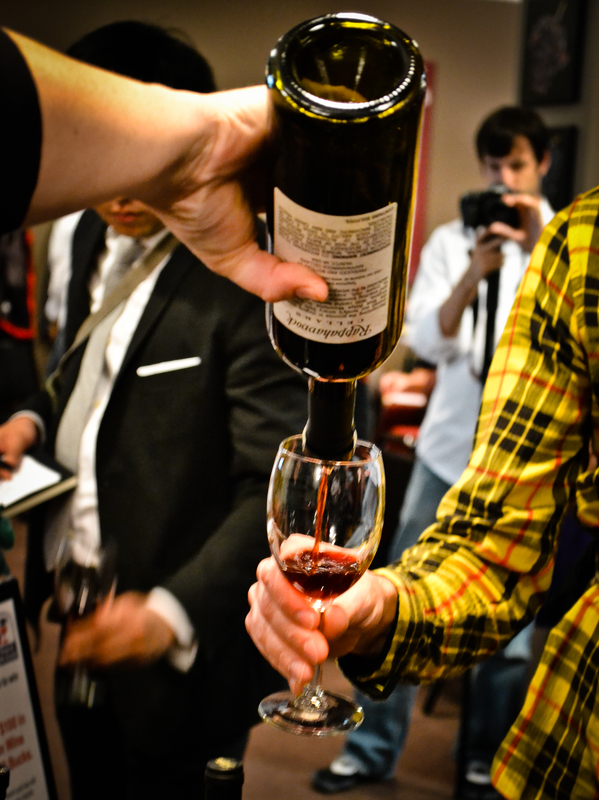 “Virginia Wine Versus the World”), which featured Virginia wineries. DC Wine Week is the brainchild of Vanessa French and Lisa Byrne, who “mindstormed the concept on a cocktail napkin–over wine, naturally.” It’s meant to bring together DC’s wine community and is “dedicated to enjoying wine, wine education and an opportunity to help support the area’s growing local wineries, wine shops, wine bars, restaurants and merchants.” It has been pretty darn successful, and there has been significant media buzz from both print and blog sources. After getting lost walking from the Pentagon City metro in the light but persistent rain (and realizing I had left my camera at home), I finally found my way to the Washington Wine Academy. There were a lot of people (and a lot of couples, proving again that Virginia may indeed be for lovers). The first part of the event was an open tasting of nine Virginian wines; the second part was a blind tasting of three whites and three reds. I found this wine cloyingly sweet. It tasted like a generic Pinot Grigio or mass-produced Riesling. Sorry! I didn’t try this wine… I was chardonnayed out from the Schramsberg tasting I had attended a few hours before. I gave this a try and found that, like the Chere Marie, it was cloyingly sweet and generic. I didn’t try this wine. After the Viognier I skipped straight to the reds. This had a pretty, dusky nose that was, for me, marred by an almost candy-like quality. The wine lacked body and, while pleasant, didn’t do anything for me. This was my favorite wine of the evening. Having been in bottle for 10 years, it was a wonderful brick color. The color and nose reminded me of old Rioja, specifically R. Lopez Heredia. This was round, with generous flavors of prune, red bean paste, quince, and herbs. Good acid, too, and overall simply a joy to drink. I came back to this wine again and again throughout the evening. I had had a bottle of the ’06 Octagon once before, and I was impressed with its length and depth of flavor, though I felt that it felt a bit awkward (perhaps it was in its awkward adolescent stage?) even with decanting. The Octagon appeared to be the favorite wine of the evening, a conclusion I can support though I personally liked the Rappahannock much better. This had good structure and a nice tannic grip, blueberries on the palate, but it was lacking a certain oomph. I’m sure this wine will be killer in a few years. Any wine portmanteau has my vote, and the Ameritage was really tasty. Prune, less fruit than the Barboursville, with pencil shaving notes and a nice savory note on the finish, this would make good refined drinking. I highly recommend this wine! I’ve been excited about Norton pretty much since Riedel introduced its Norton glass, but I had only tried some uninspiring examples in the past. I was excited about the Chrysalis, as it is one of the most respected wineries in Virginia. My drinking partners and I agreed that this was underwhelming. I found it was dominated by a green grape vinegar quality (one commentator noted that some examples of Norton exhibit elderberry notes, which I can definitely see). I did not find it to be unenjoyable, however: it was like a more acidic Sangiovese. I think it would be good with Italian food. My favorite part of the evening was yet to come. Alex Evans, one of the Academy’s staff members, presided over the blind tasting with considerable energy and aplomb. We had to guess whether the wine we were drinking was from Virginia or from anywhere else in the world. The three whites were Viognier, and the three reds were Cabernet Franc. How did I do? I did okay, I think. I correctly identified the first white wine as being a Viognier blend from the Rhône because it reminded me of Chateauneuf-du-Pape blanc, and I also identified that the third white was from the New World (though I thought it was South Africa, when in fact it was Virginian). I also identified the first red as being from Virginia, and from its sediment and earthy, “brett” quality determined the second red was a French wine from the Loire Valley. I thought the last red was Virginian but it was Californian. New World though, right? The takeaway for me was that Virginia wines are extremely well-made and are poised to make quite an impression. They stand up quite nicely to wines from California and the Old World. I haven’t yet been a fan of Virginia white wines, but many of the reds I’ve tried were good and even superb. I was blown away by the ’01 Rappahannock Cellars and would also like to try the ’06 Octagon again in a few years. Given that the Octagon is only around $35-$40 retail, I would say that Virginian reds are smart buys at this time. Thanks for the great blog – I’m thrilled that the 2001 Cab Franc is holding up so well! No problem, Allan. Thanks for making some terrific wines!